There's some minor guilty pleasure to be had, when the rewards from a successful Kickstarter campaign finally ship, in going back and looking at the estimated delivery date. For instance, the Articulated Icons are just now reaching backers' collections; the original projected date? May. Of 2016. But honestly the important thing is they're here now, which is more than we can say for some Kickstarters (right, Digger?). I do not fear death. We are old friends, death and I. His face is known to me. My skills are considerable. I face death bravely, without fear, without hesitation. I do not shrink from death's embrace. I face him willingly. I stare death in the eyes. I let him see the depths of my soul, that we may truly know each other. If death wished to take me, death would know he had fought a ninja. He would know the touch of my blade. Death would bleed before he could claim me. I could accept an honorable death. I would welcome it, as reward for a life fought well. But I promise you: death will not be the end of my story. That, by the way, is only a portion of the story that was presented in one of the project updates. Articulated Icons: The Feudal Series is all about ninjas and samurai, with the ninjas availble in either red, white, or black colorschemes. 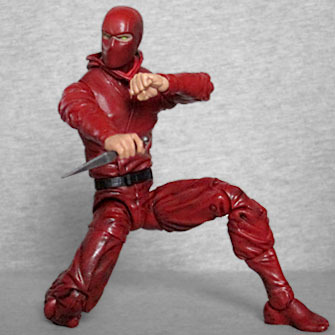 I opted for this red one, because while Hasbro has tried two times now, we were still in need of a really good Hand ninja. And since these figures are done in the 6" scale, well, third party to the rescue! You could make an argument that this "isn't" actually a Hand ninja (The Hand is trademarked by the Marvel Entertainment LLC), but it's not like ninjas wearing deep red uniforms are a common thing. It's either The Hand or GI Joe (and if that's the case, Sgt. Slaughter is ready to send him home in a ditty bag - an itty bitty ditty bag). The basic ninja uses the basic body, and the fact that he's mostly one color means you can really appreciate the sculpt. He's wearing some totally average ninja pajamas, from the tight tabi boots with a notch for his bit toe (to help when climbing a rope) to the layered, long-sleeved shirt. There are many wrinkles all over his outfit, suggesting it's made from a very thin material. You know, like silk. His outfit is cinched with a black belt, and his hands are bare. The packaging doesn't list any specific sculptor (just "designers," which could mean anything), but the original Kickstarter said the toys had been prototyped by Gentle Giant, so... maybe them? In any case, the sculpt has a nice level of detail for a sculpt we'll be seeing a lot of. The figure just breaks the 6" mark, which makes it a little small for the constantly inflating scale of superhero toys. Fricking size creep, man! On the other hand, as a generic cannon-fodder ninja, being slightly shorter than average may be just fine. 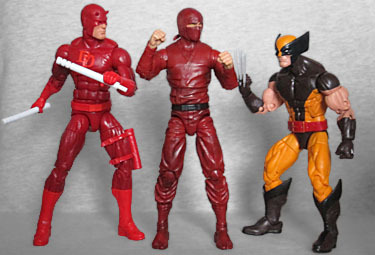 It's not like DCD's Icons line, where we got major characters in a strict 6" scale that made them too puny to mix with any other toys: this ninja is a nobody, and he'll look just fine facing off with either Daredevil or Wolverine. Or both, because Fox and Disney can't tell you how to integrate your collection. The articulation is great! The ninja moves with a balljointed head, hinged neck, swivel/hinged shoulders, swivel biceps, double-hinged elbows, swivel/hinged wrists, balljointed hands, a swivel/hinge torso, swivel waist, balljointed hips, swivel thighs, double-hinged knees, swivel shins, and swivel/hinge ankles. The hips are a little stiff, almost jumping from position to position like ratcheted joints, but everything else moves smoothly, and nothing was broken or stuck out of the box. The waist might seem superfluous, but it was likely done to make swapping the upper body easier: if you have a shirtless character, you only need to redo the chest, not the entire torso, since the pelvis will remain the same. The basic ninja comes with a few accessories. 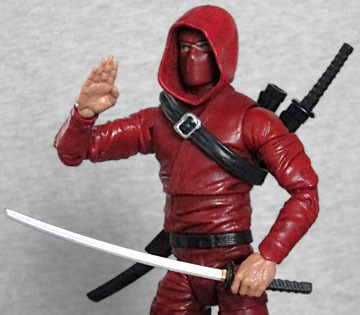 In the package, his face is hidden behind a tight mask, while an alternate head features a looser zukin - the traditional wrapped "ninja mask." It even has little ties poking out at the back where he knotted it! The set includes two different hoods to go with the tight mask: one pulled up over the head, the other dropped back onto the neck. There are also two alternate sets of hands: if you pull his fists off their tiny balljoints, you can replace them with either gripping hands or flat chopping hands. His weapons are a kunai and two swords, the katana and wakizashi. The swords have their own functioning scabbards, and the scabbards fit into a belt loop. The loop has a peg on it that will allow it to either plug into the figure's waist or his back. 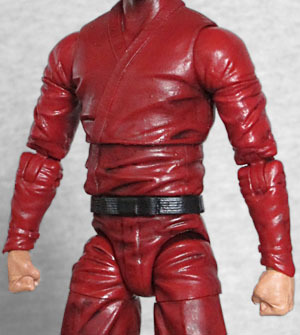 And if you don't like a full red torso, you can throw the black sash with the silver buckles over top of that - and it even has a hole in it to allow the peg on the belt loop to pass through, so thatt can still be plugged into the ninja's back while he's wearing the sash. It's taken a while for the Articulated Icons to become a reality, but the wait was worth it. Even without the amazing ninja magic that mystically transformed a generic figure into a full-fledged member of Marvel's Hand Clan as soon as I opened the box, this is a toy with a nice sculpt and above-average articulation, and what more could you ask?